Roz Morris is a novelist, book doctor, and writing teacher, and has sold 4 million books as a ghost-writer. In her first collection of essays, Not Quite Lost: Travels Without a Sense of Direction (Spark Furnace), travel writing intersects with memoir. Morris visits off-the-beaten-track spots, mostly dwellings in rural England such as architectural follies, medieval gatehouses, and a leaky stone fort built to thwart foreign invasion. She has a weakness for houses that are unfinished or have a mystery about them. She is funny, perceptive about what these eccentric places say about her country, and like all great travellers, she manages to meet unforgettable characters who would not be amiss in fiction. Anyone who writes travel books must wrestle with the narrator's persona: does the writer try to erase it, or highlight it? Morris is in the latter camp. Although she and her husband often poke fun at her Tigger-like enthusiasm, that's precisely what makes her such a delightful traveling companion. 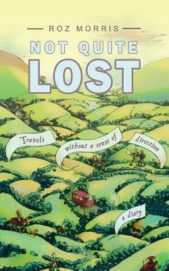 Not Quite Lost is an entertaining, insightful book that invites comparisons to Bill Bryson's British odysseys. Garry Craig Powell: First, I found the book delightful: amusing, entertaining, and often thought-provoking. It's not exactly a travel book—perhaps we can talk about that—but it certainly does something that most good travel books do: it makes us want to visit some of the places you describe. And I'm guessing that was intentional, since you give more information about some of the places where you stayed at the end of the book. Did you set out to write a book of essays about visits to unusual places, or did you discover that you were writing such a book as the essays piled up over the years? Roz Morris: Definitely the latter. I've always scribbled in notebooks, and I have a particular notebook I keep in my suitcase for when I'm off my home turf. It's a bit special—bound in leather, with the word 'visitors' stamped on it in gold. I like the Alice in Wonderland logic—a visitor's book is the book I write in when I am a visitor. I'd been keeping it for more than twenty years and discovered I had quite a collection. My husband Dave, also an author, suggested I organise them into a book. At first I misunderstood him, thinking he meant use them as material in novels, but he thought they'd make a standalone book of essays. I'm primarily a fiction writer, so I didn't take him seriously. But I came to like the idea. It set a challenge. The pieces were personal and random, a diary of place and curiosity, but maybe I could work them to invite others in. As I reread the book I had a surprise—these travels were prequels for my fiction, long forgotten. Some of the locations had worked their way into my novels as settings—a seaside town out of season, honest and dowdy; a group of cottages built within the ruins of a crumbled mansion, full of romantic relics. Also, my themes were there, colouring the questions I wanted to ask—ideas of what lies beneath the surface and the unusual ways we can be haunted. Rereading this book was like following a string backwards through time and discovering where I came from. GCP: The first essay, "Eve of destruction: a childhood home," is about Edge Croft, the large Arts and Crafts house you grew up in, which has an elegiac quality about it. It's sad—and perhaps revealing—that your parents' renovations made it "look like a bus garage." You leave a great deal unsaid about your family life, but it's very suggestive that after your parents' divorce you became estranged from your brother, and I believe didn't see your mother for a long time afterwards either. RM: That's correct. When you describe it like that, I realise it looks unusual. But every family creates its own norm. That was simply how we operated. GCP: In a way, it's typically English to avoid an emotional examination of what went on, isn't it? I can't imagine an American writer doing that. And yet, perhaps precisely because you say so little, the effect is very moving. I was left wanting more. RM: Thank you—that's what I'd hoped it might do. That piece, "Eve of destruction," wasn't even planned. It was a late entry, happening in real time as I was editing the other pieces. Here's the story—a school friend messaged me to say my childhood home had been demolished. Immediately I felt the need to collect as much of it as I could. I looked on Google Earth and it was still standing. Streetview had more recent pictures; the demolition had begun. The house had always been a source of wonder to me—it had features from a more elegant age. Old fireplaces were hidden behind the plasterboard in the bedrooms. When I heard that the house had gone, I felt the need to write everything I remembered about it, to write its obituary. There certainly is a lot under the surface of the piece; there are many longer stories that deserve more time and attention. But this wasn't the place to tell them. Is that restraint typically English? Perhaps it is. When you're on the inside looking out, you never know how typical you are. I'm certainly very fond of writers like Graham Greene and Evelyn Waugh for the way they use surfaces with devastating power. And I also love a more detailed and open style—I'm currently rereading Ann Patchett's Bel Canto, which savours each emotional shift in detail. But for "Eve of destruction," I was thinking in short form, with a clear container, like a songwriter. GCP: In "Staircases to nowhere: Torrington, Devon" you quite explicitly state your fascination for houses with hidden parts, and this house, Stevenstone, was also demolished, like the family home, which made way for a professional footballer's four-storey pad, which "will look like Lidl" (a supermarket). In other essays, you and your husband Dave stay in medieval gatehouses, eighteenth-century follies, a Martello tower, a Palladian villa . . . It strikes me that there's a theme here. A taste for the emblematically romantic. Would you agree? It seems to me a kind of Elysian yearning, a longing for a mythical world one feels must exist, which also feels quintessentially English. RM: I think the English have a tradition of stories centred around beautiful houses—Daphne du Maurier with Manderley (from Rebecca); Charlotte Brontë with Thornfield Hall (Jane Eyre); Evelyn Waugh with Brideshead; and of course, the TV series of Downton Abbey. These houses are more than settings; they are invested with memories, representation of their times, qualities of the psyche. I certainly find places fascinating, especially if they have been extensively altered. I love to see the patterns of former use—if a house was divided, say, or walls have been reconfigured. And, of course, if it has gone altogether. There's something ruthless about the way we colonise and remake for our own purposes. What draws me to them? An interesting question. I'm not thinking life was better in those older times. That would seem sentimental. Taking those houses as an example, although they had glory days, life was generally harder—there were few educational opportunities, no legal rights, no healthcare, few of the scientific advantages that mean we're not beaten by infections or bad eyesight. What fascinates me is this sense of a continuum, of how many lives have passed through a place, doing what they needed to, leaving footprints. Not lives that I think might have been better, or simpler, or innocent—or, conversely, harder. Just lives. Life. I love the sense that we're fitting in with places that have already seen so much—and not just places. I'm drawn to furniture and books that are second-hand because they come with a patina of experience. My writing desk is an old dining table that a neighbour put out for the dustmen to collect. I painted it and it has sat under my computer for my entire writing career, and I love the idea that it was once the centre of a completely different home. My house in London has leaded windows, and some of them are bent from a bomb blast during the Second World War. I think it would be a shame to replace them as they are a postcard from the past. I'm also drawn to objects that can be framing narratives, which brings us back to the house in "Eve of destruction." A bit like a fable, where something can be apparently simple but surprisingly rich. GCP: I'm a fan of framing narratives and old objects too; when you're in a place that's redolent of history, you feel how illusory time is. That's very poignant. Of course, many of the essays are quite simply straightforward comedy: "Pardon our French," for example, or "You are not Morgana and I am not Merlin," which portrays the Yoda-like ex-solicitor Michael, who has premonitions, believes in a goddess figure, and is in love with a far younger woman. In these, in classic travel writer fashion, you often use the practical, down-to-earth Dave as a foil for your own giddy excitement. Here's a laconic example from "Travels without a sense of direction" in which you persuade him to stay at a Martello tower. Dave says "It's a stone pillbox." Roz: "It's got a moat and a drawbridge." Dave: "It looks . . . like one of those public conveniences on Clapham Common." These are hilarious contrasts. RM: I think I'm lucky that he still agrees to travel with me! That is genuinely how our temperaments work. You've seen Spinal Tap, right? If I were an amplifier I would be on 11 all the time. In real life, Dave tames some of my excesses and lets me laugh at them. Happily for this book, he worked very well on a narrative level. I guess that's one of the bonuses of marrying a writer. GCP: I should think so. But even in an essentially comic episode like this one, in which you are kept awake all night by "The drips [which] formed a chorus of sounds as extensive as an orchestra," there's a touching and thought-provoking ending. You visit a bookshop, in a decommissioned chapel, in which there's a notice on the front table saying "Please bash can with stick to get attention"—again, so delightfully, eccentrically English—and you end with this: "If the Sea Devils ever triumph and we have to hide in Martello towers, or the ocean churns our towns into rubble, or the murmuring voices drive us out of our power stations, we will build our civilisation again from places like this." That's characteristic of your style, I think, which might be described as "restrained lyricism." You have a pitch-perfect ear for the language, but you pick out only a few details, the telling ones. RM: I try to! I admire writing that the reader can surrender to. Part of that is the use of detail—show the reader what they need, linger only for as long as necessary, then move on. George Orwell, Ray Bradbury, Hilary Mantel, Stella Gibbons (to mention just a few I've read recently)—they're like fine musicians with their sense of pacing, expression, and colour. I'm a slow reader because I become trapped by a well written sentence. Really, I have so many books I want to read but I need several brains so that I can get round them all. GCP: You have a background in journalism, don't you? Do you think that helped? There are two schools of thought on that. RM: I think I understand what you mean about the two schools of thought. For many years I've worked as a magazine subeditor, which means ruthlessly wielding the scalpel. It's taught me to edit for accuracy and flow—to strive for precision and to grip the reader's attention. especially narrative styles where you give characters room to speak. I've met a lot of novelists who've crossed over from journalism and they have to unlearn some of the reporting habits, particularly when they write novelistic scenes. Here's an example. The journalist's instinct is to present a conclusion to the reader, then the evidence to stand it up. E.g. "Jane was not very confident before her driving test. 'I'm really worried,' she said." But if you were writing a novel you might not present it in that order. Instead of telling the reader that Jane was unconfident, you might want the reader to experience it. So you'd write a couple of lines that showed Jane wiping her sweaty palms on her jacket and revising her Highway Code even though she knew it by heart. This lets the reader add the conclusion about how Jane feels and it has much more impact—the classic "show not tell" principle. GCP: Right. That brings me to the fact that you also tutor people who want to learn to write for The Guardian. I suppose that means that you think formal instruction can be useful? RM: Yes I do, but there are two elements here: aptitude and development. Every profession on the planet involves using an aptitude. For instance, I would be useless in any job that involves maths because I have no natural ability with numbers. But I'm lucky to have a flair for words; I notice them; I enjoy using them carefully. So I'll gravitate to professions where that sensitivity will be an advantage. And it also happens that I have a creative urge—I find it easy to invent. Neither of these qualities can be taught. You're either wired for them or you're not. But each one of us, no matter how naturally gifted we are, has blind spots, so we need development and work. There are a number of ways to get this; it's not all formal instruction. We learn by feedback from other writers. Also by reading—any books, not just craft manuals. But at some stage we'll need the input of somebody who can see what's missing, and that's where a tutor might help. I never took a formal writing craft course, but I had a lot of people I learned from. I hung around with good writers who enjoyed talking about technique and critiquing each other's work. But my broadest education was a critiquing group run by a literary agent, Juri Gabriel. There was a wide range of writing styles and genres in the group, and Juri was able to nurture and guide them all with insight and firmness. Listening to him each week added up to a wide-ranging education in how fiction works. After that I did a lot of ghostwriting, and had hands-on individual feedback from editors to fit their readers' needs. So I think we have many, many teachers in our writing lives. Formal instruction is a part, but the biggest factor of all is the writer's own persistence. A tutor can guide and steer, but the writer has to put in the hours. All arts are, in the end, learned by self-directed study and dedication. GCP: And what do you think of graduate creative writing courses? RM: I think they're a mixed blessing. If taken at the wrong time in a writer's development, they can stultify. We've all seen the "MFA novels" that follow predictable patterns and lack originality or spirit. But I have a number of writer friends who've already published novels and are taking MFAs to guide their next long work. I think that's valuable mentorship because you already have some solidity in your own style and identity. The guidance will enrich your work, rather than bury you alive. If I had the time—and the money—I'd love to develop a novel that way. The house looked stranded, as if it had been dropped straight onto the grass by a giant on the top of a beanstalk. A thatched roof that looked too big for it, like an outsize helmet. White walls striped with silvered oak beams, which gave it the cosy look of favourite pyjamas that had faded through many years in the wash.
That's such good writing: it's not only vivid, but manages to evoke fairy tales, a comic image, and the nostalgia of childhood. You're not only revealing the place to the reader but how you feel about it. And you're a very personable guide. I suppose most good travel writing makes a character of the narrator, although some famous travel writers, like Jan Morris, try to keep themselves out of the writing. I wonder if you've been influenced by anyone we might know? RM: When I was growing up, my favourite writers were the ones with great warmth and personality: Gavin Maxwell, James Herriot, Gerald Durrell, Eric Newby. And of course, Charles Dickens, the ultimate big-hearted intrusive narrator. I loved their empathy and affection, their own particular flavour of humanity. I was captivated by that as much as by the facts of an experience. I've always liked the personal essay, too. When a writer can take a thing and turn it inside out, and turn themselves inside out too, you feel stitched into their soul. An example I liked recently was Stephanie Gangi. She lives alone and she wrote about how many times she was touched in a week—it's bold, simple and so poignant. I won't try to say what it communicates, because her piece does that better than any explanation. I like poets that do this too. I'll pick out one of my favourites: "Before You Cut Loose" by Simon Armitage. He describes how difficult it is to abandon a dog because it always comes back to you, but these simple statements carry much more. So in my book I'm describing places and events that aren't, in themselves, notable or dramatic. I didn't go to a dangerous or notable place, like the Antarctic. I didn't go on a whacky quest like dragging a four-poster bed around the M25 motorway. But still I had rich experiences. So I wanted to invite people in, make them see what I saw. 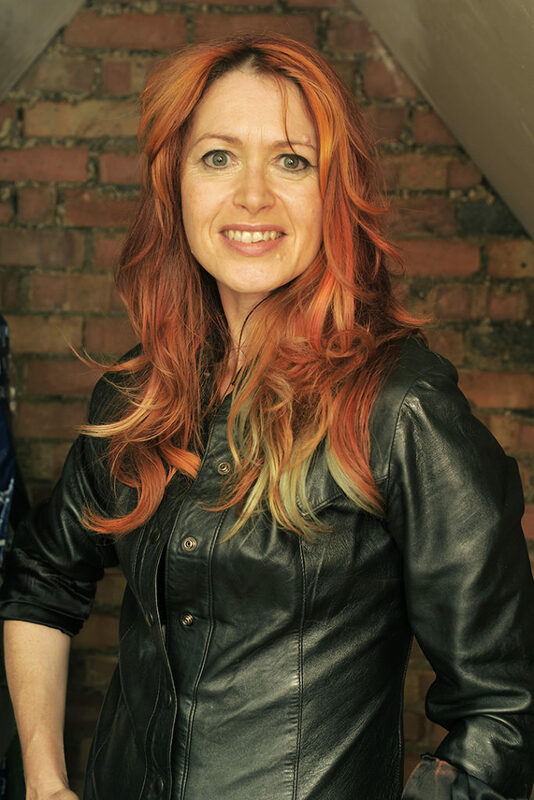 GCP: Although I enjoyed all the essays, my favourite is "Strictly faking it," in which you, a writer who takes occasional dance classes for fun, audition for a part as a dancer in a commercial. It's funny and fascinating, partly because we learn so much about what it takes to become a dancer and work in an ad, and partly because you interweave your reflection on the experience with your thoughts on writing. Here's an extract: "From the first moment I was offered the job, I looked for people who would reassure me I could do it, give me permission to be there . . . But all I needed to do was give myself permission." And that's as true of writing—or anything else—as of dancing, isn't it? RM: So true. And as I wrote that sentence, I realised I always think that way. When you write you sometimes end up as your own analyst. I was talking to another writer about this piece because she also felt it struck a strong chord. When I start a project, I think I won't be able to do it, that I've been too audacious in my hopes. And then I have to trust the process and inch along with it—"bird by bird," as Anne Lamott would say. But my writer friend added this: if we didn't feel that frisson of possible failure, we might not care enough to do it justice. And she's dead right; the fear keeps us on our toes. This entry was posted in Uncategorized and tagged Winter 2017 on January 23, 2018 by Kelly.